This 6 Year Cancer Survivor Scorched The Jets Defense, For A TD! Gio Toribio is only six years old, but he’s already beaten cancer. Saturday night, he used that strength to beat the New York Jets’ defense as well. Toribio was New York’s special guest at the team’s Green & White practice at Rutgers University. Gio, took a handoff from Jets QB Josh McCown and followed his blockers through a hole off the left tackle, and then sprinted past diving defenders for a 40-plus yard touchdown run that brought the fans in Piscataway to a standing ovation. Gio was diagnosed with Stage 3 anaplastic large cell lymphoma when he was only 4 years old. He underwent chemotherapy treatment, but he wasn’t alone in his journey. 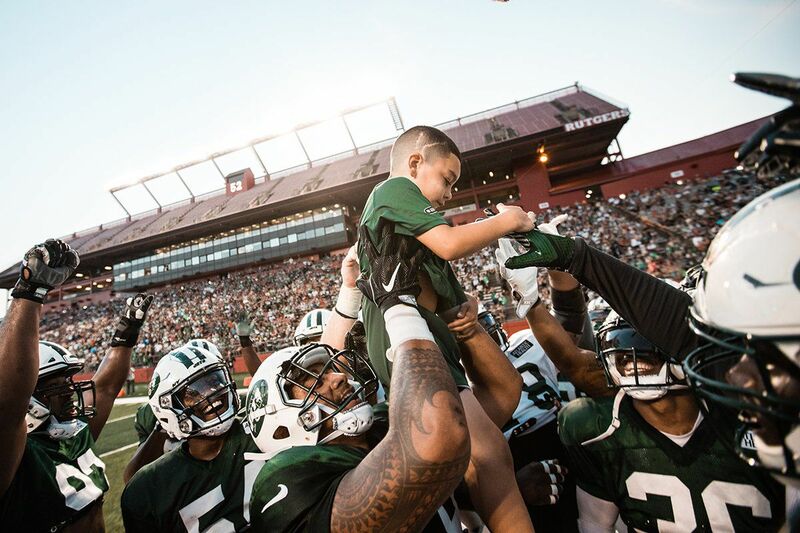 Jets’ standouts Buster Skrine, Jamal Adams, and Darron Lee each took time to show their support for the young fan from Ossinning, NY. Lee in particular made a strong connection with Toribio, who also suffers from McCune-Albright syndrome — a condition that makes his bones brittle and will keep him from ever playing full-contact football. Previous article You’ll Love This Gorgeous Girl! She’s Amazing!! Next article Ray Lewis Gives Shout out To An Emotional Michael Phelps During HOF Speech! You’ll Love This Gorgeous Girl! She’s Amazing!! Ray Lewis Gives Shout out To An Emotional Michael Phelps During HOF Speech!